North Staffordshire Combined Healthcare NHS Trust provides mental health, addictions, children’s services and learning disability services predominantly to people living within Stoke-on-Trent. Lisa Sharrock (Mental health and vascular wellbeing team manager) and Sue Molesworth ( research associate) from the Trust has led the way in pioneering a quality of life improvement for patients diagnosed with mild cognitive impairment or mild dementia by supporting the management of memory problems associated with these conditions. 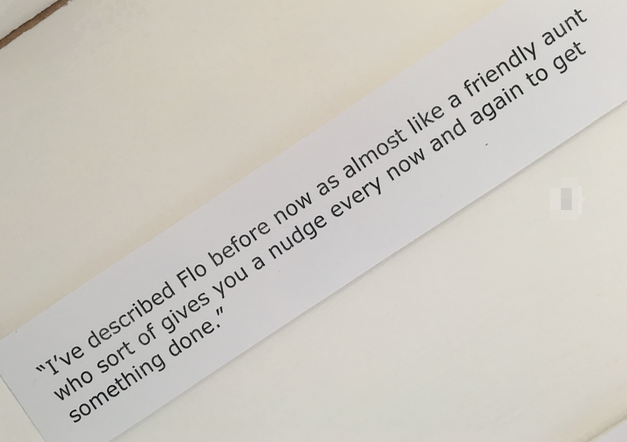 Maximising Flo’s unique persona based messaging, patients report that the real time interactions offer in the moment, actionable advice. This combination enhances patient’s current strategies to support their memory function and patients report the confidence, independence and reduction in isolation that this has created throughout daily lives. Flo assists with the aim of scaffolding and supporting short term working memory via (a) memory improvement informational messages and (b) message prompts to patients to regularly wear their Autographer. There is value in adopting a pragmatic focus directed towards activities for optimising wellbeing; maintaining independence and helping people to remain living in their own homes for as long as possible (i.e. ageing in place); and supporting self-management, including building individuals’ self-management capability. Alongside these pragmatic options there needs to be parallel efforts using theory-driven approaches to develop external memory aids that are effective and are acceptable to people with dementia or MCI. The Autographer plus Flo intervention may be described as a rudimentary attempt to assemble an external memory aid for a population of people whose needs and difficulties are well understood by the clinical team involved in the development of this project. The collaborative approach has involved not just the clinical team but also people with dementia and MCI, people with expertise in user facing technologies, organisations such as the CCG which have extensive experience in implementing technology to enable care, and information analysts and research staff who have expertise in collecting and making sense of complex data. The analysis of data collected for an evaluation has increased understanding of aspects about each of the two technologies, such as the importance of prompting or nudging for people experiencing significant memory problems – which both Flo and Autographer do in different ways; and the potential significance of reviewing Autographer images for re- creating the sensorial experience (the feeling of ‘being there’ again), with implications for the re-laying down of memories. Analysis of the WEMWBS and ACE-111 data has drawn attention to wellbeing and memory, respectively, suggesting that something interesting may be happening in these domains that is worth further exploration. The idea of recontextualising the ACE-111 scores in a bigger comparable population is being considered. The role of Autographer plus Flo as a helper has also been emphasised, in prompting memory, providing strategies to manage day-to-day life, and for helping with confidence. In addition, some data suggested that Autographer specifically may have helped episodic and semantic memory in some participants. An unexpected notion that has arisen is that some participants have gone through quite a deep process of individual self-reflection through interaction with information pushed out to them via Flo text messages and through reviewing their images. The evaluation was formally published on 20th July 2016 at the 'Art Stop Stoke' exhibition venue, with service users and public invited to view and discuss the success of this innovative study. The impact that the combination of these two simple technologies made on those using them was immense, and brought to life by service users themselves at the exhibition & evaluation launch. Looking to the future, the team is currently working with service users and a local technology company to develop an App that uses low-cost wearable technology for patients diagnosed with MCI and early dementia to help with self-management of their condition.